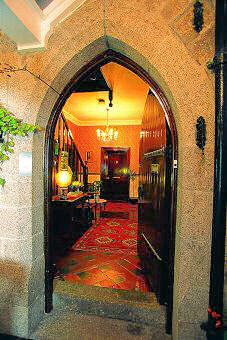 The Old Vicarage, quality accommodation in St. Ives, Cornwall. Dianne, Martin & Jack welcome you to the Old Vicarage, St. Ives. An attractive historic building set in peaceful wooded grounds in a quiet residential area of St. Ives. Award-winning breakfast with Full English, Continental and Vegetarian options. Now a 4 Star Guest House, so you can enjoy hotel facilities (bar, fully en suite rooms, internet access, free parking) at bed and breakfast prices. Plenty of free parking in the grounds throughout your stay. Comfortable, clean, spacious accommodation with all rooms en suite. Family friendly with cots, highchairs and children's portions for breakfast. Licensed for Weddings and Civil Partnership Ceremonies. Pet friendly (October to April only), with dog walking areas nearby. Well placed for exploring West Cornwall, but still within St Ives.